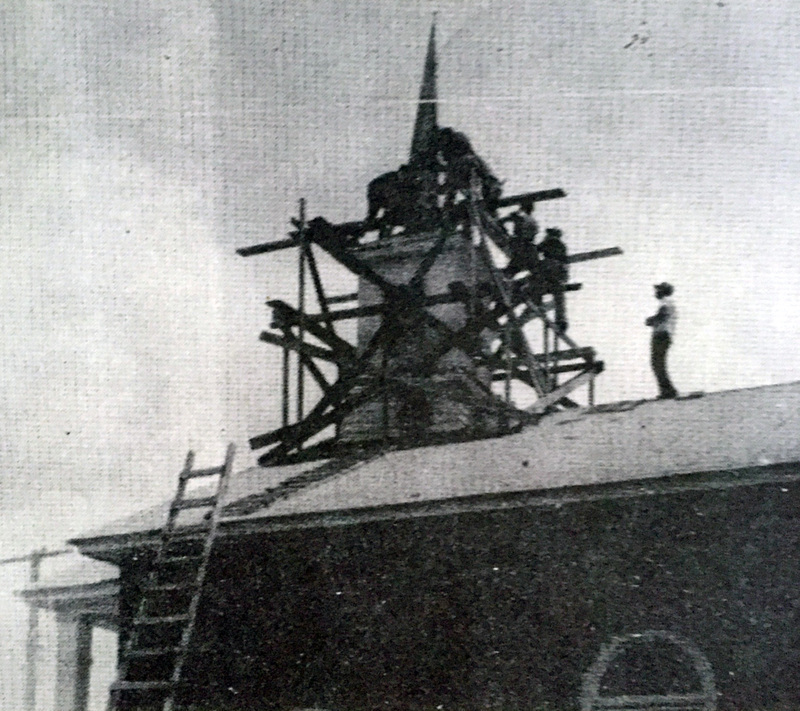 The original sanctuary was completed in 1914 under supervision from T.F.S. Weatherby. 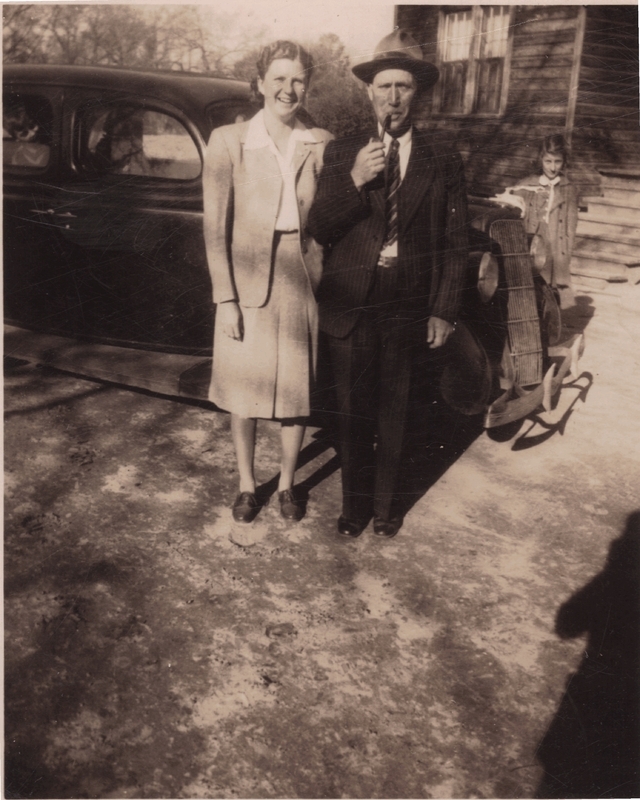 Lillian and James "Bubba" Hanna head to church on Sunday morning. 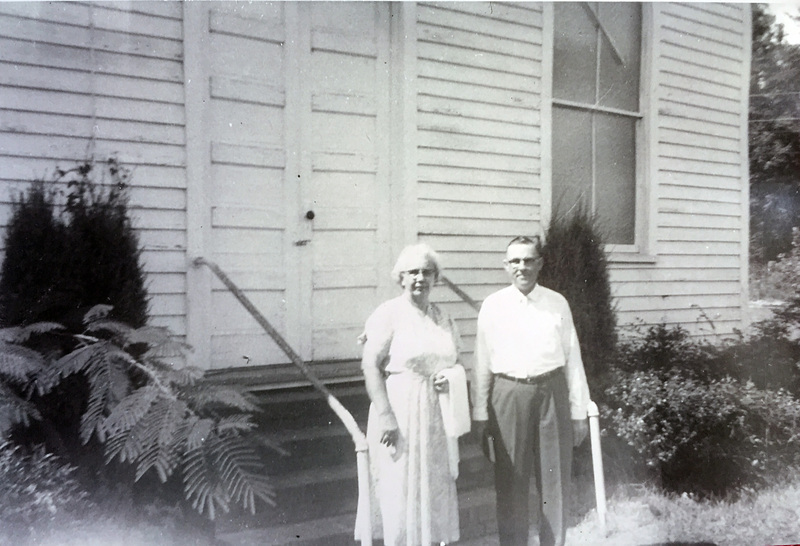 Bubba was one of a few faithful members that kept Johnsonville First Baptist Church open for worship during lean years of the Great Depression. 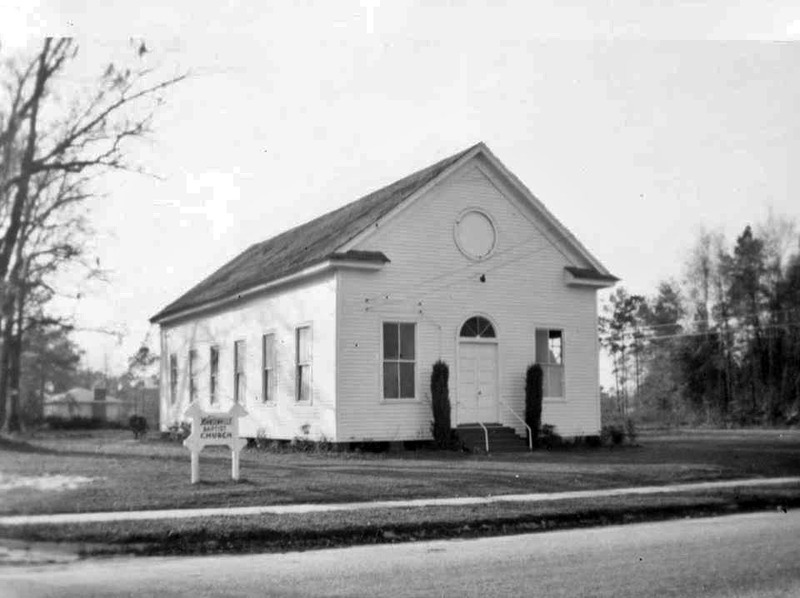 The original Johnsonville First Baptist Church was organized in 1912 as a Sunday school group which met in an old tobacco prize house on Broadway. The tobacco house was on the lot where M.B. "Bub" Gaster's residence later stood. In this year, Johnsonville was first parcelled out by P.D. Poston and the grid of the city streets was first formed, including Elm Street which runs along the side of the current church's location. 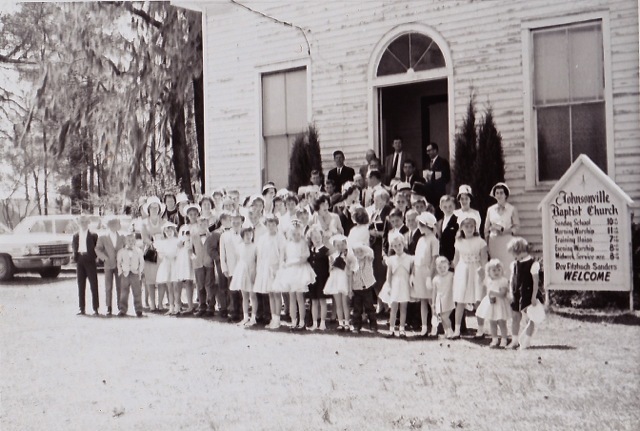 The original structure of the church was a traditional southern wooden sanctuary and was completed in 1914 on land donated by Mrs. S. Eleanor Haselden Eaddy. Trees for wood were donated by members and friends of the church. The lumber was sawed by E.B. Poston and hand-planed by Morris Powell. T.F.S. Weatherby supervised the construction. After the death of Dr. Brown, Rev. W.C. Wallace was called as pastor in 1916. He was followed by Rev. B.D. Thames, and Rev. Fallaw. Rev. L.H. Carter took the helm in the early 1930s. The churched faced very difficult circumstances as the Great Depression led to banks closing and many members being forced to move away. For a period of time, only 2 members met on Sundays: James "Bubba" Hanna and E.B. Poston. They opened the church doors each Sunday morning for one hour. Eventually, more members joined their efforts and the congregation grew. In February of 1957, Rev. W.J. Kennedy was called as the first full-time pastor and served until 1959. In February 1964, a building committee met to draw up plans for a new sanctuary. The members were Carroll Barnhill, Archie Rhodes, Delance Poston, P.D. Poston, Tracy Lane, Buster Hanna, and J.J. Mitcheom. The plans were drawn up and donated to the the church by Munford Fuller. A charter was drawn up and a board of trustees was elected. They were James "Bubba" Hanna, P.D. Poston, Randolph Langley, Robert Haselden, and J.J. Mitcheom. Construction was supervised by Grier Brothers of Hemingway for the new sactuary and education building. 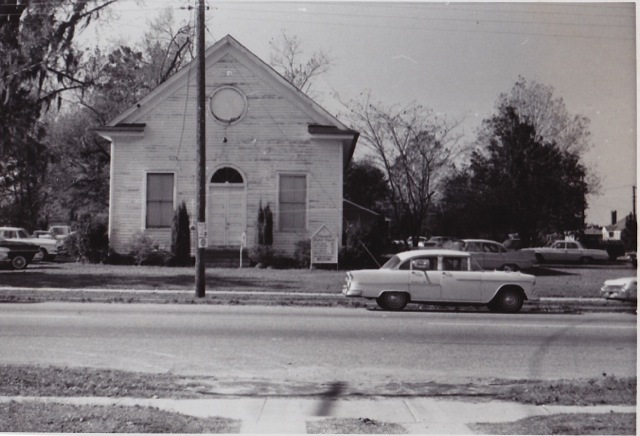 The church voted to sell the old church building to Delwood Altman and the pulpit stand and benches were sold to the Free Will Baptist Church in Pleasant Hill. 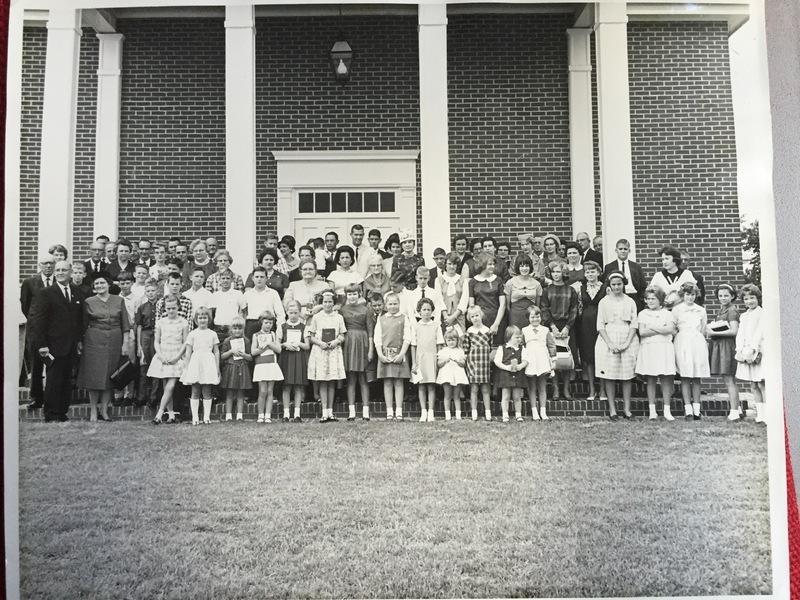 The final service in the old building was held on August 29, 1965. 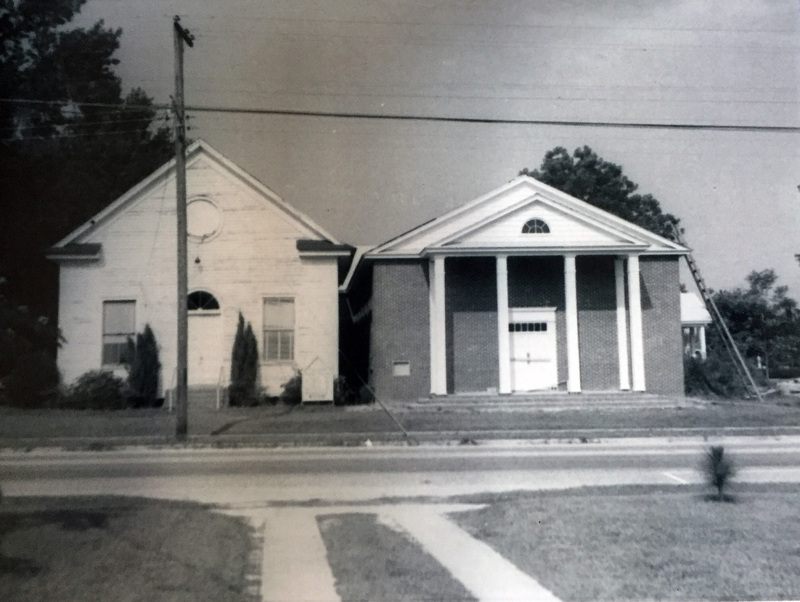 The new sanctuary held its first service on Sept. 26, 1965. 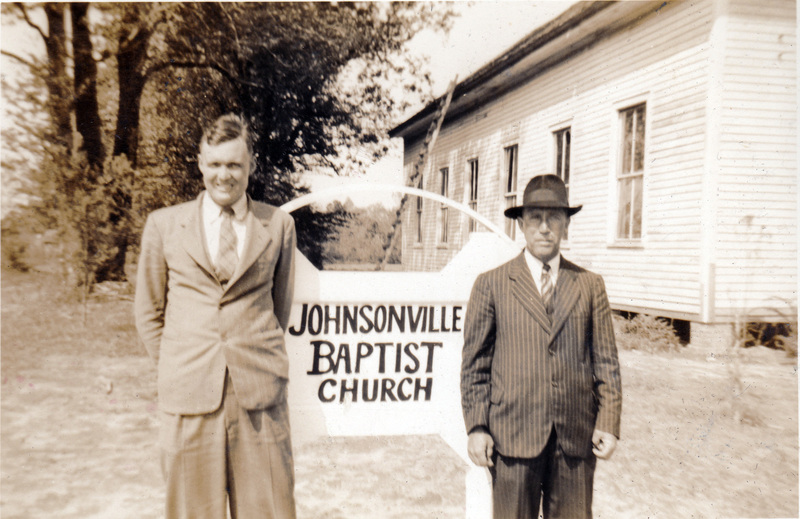 Johnsonville First Baptist celebrated its 100th anniversary in 2013.